The impact of chronic illness is multidimensional, affecting not only the individual afflicted, but also their family. Effects range from depression, anxiety, a potential loss of employment and associated reduction of income, increased stress, physical limitations/pain, emotional problems, a decline in self-concept, changes to their social life/status and issues relating to medical adherence. Thus, in order to successfully adapt to living with a chronic condition, an individual and their family must adopt permanent behavioural, social and emotional change (Dobbie & Mellor, 2008; Stanton et al., 2007; Sarafino, 2006, p. 366). However, it is unlikely the sufferer or their family has the resources to initiate such changes themselves, and to that end, a range of psychosocial interventions exist that aim to help them adjust to the reality of their chronic condition, adhere to a regimen that will manage and reduce symptoms, and improve their quality of life despite their condition. The aims for the majority of psychosocial interventions are to give the patient (and where appropriate their family) autonomy in managing and living with the chronic condition. Self-management is the key tool, giving patients coping strategies (de Ridder & Schreurs, 2001), problem-solving skills and greater ability to cope without frequent recourse to a health professional. Some psychosocial interventions are more basic and target a single element such as stress or anxiety, which are not only symptomatic, but also exacerbate the condition. For example relaxation and biofeedback aim to teach patients how to better manage their stress and anxiety (Parker, 1995) using techniques such as progressive muscle relaxation and attentional strategies. The idea of psychoeducation is to provide information to the patient about their condition, and this can prove useful to dispel myths/reduce future-oriented worries, normalise experiences (through peer support groups) and often aim to involve patients’ families to enable them collectively to better understand the condition and cope with it (Sarafino, 2006, p. 366). Other aspects of psychoeducation can focus on skills teaching, goal setting/achievement, increasing self-efficacy, social involvement, hope and life satisfaction (LeFort, Gray-Donald, Rowat & Jean, 1998). Behavioural interventions typically target compliance and adherence to a regimen, for instance motivating patients through a programme of self-monitoring and rewards, or tailoring the regimen to the perhaps behavioural tendencies. Adherence to a regimen has been shown to be important for chronically ill patients to reap the benefits of interventions. Cognitive interventions, on the other hand, help patients to analyse their thoughts, beliefs and emotions, and to challenge ‘unhelpful’ or negative thoughts, which, in the case of a chronic condition, are quite often a result of co-morbid depression. Generally speaking the best interventions combine psychoeducation with cognitive-behavioural methods, using an evidence-based approach. Often, secondary co-morbid conditions (e.g. depression or anxiety) can effectively be treated as part of this therapy, and given that chronic illnesses often give rise to secondary co-morbid diagnoses, an effective set of therapeutic interventions would ideally target these concurrently (Bair, Robinson, Katon, & Kroenke, 2003). All these interventions can be delivered either one-to-one or in a group setting, and could involve peer-group or family therapy (Martire, Lustig, Schulz, Miller & Helgeson, 2004), both of which have potential benefits in terms of the additional support offered (Sarafino, 2006, p. 369). Chronic Pain is a condition that affects a significant number of the population. Recent literature (Tsang, Von Korff, Lee, Alonso, Karam, Angermeyer, Borges, Bromet, de Girolamo, de Graaf, Gureje, Lepine, Haro, Levinson, Oakley Browne, Posada-Villa, Seedat & Watanabe, 2008; Hardt, Jacobsen, Goldberg, Nickel & Buchwald, 2008) varies widely as to its prevalence, with estimates ranging from between 3.5-11% (American sample, N=10,291) and 37.3-41.1% (17 countries, 10 developed, 7 developing, N=42,249). Whatever the true figure, it is a significant and debilitating health issue with associated economic costs to the individual, potentially their family, and the state. Those with chronic pain experience higher levels of depression, insomnia (Wilson, Eriksson, D’Eon, Mikail & Emery, 2002), anxiety (Tsang et al, 2008), suicide (Tang & Crane, 2006), somatoform disorders, substance abuse, and personality disorders (Dersh, Polatin & Gatchel, 2002). Specifically in terms of anxiety, chronic pain patients experience higher levels of posttraumatic stress disorder (PTSD) (Tang, Salkovskis & Hanna, 2007) and health anxiety (hypochondriasis) (Rode, Salkovskis, Dowd & Hanna, 2006). Although most research so far has focused on co-morbid depression and insomnia, a more general theory for explaining the relationship between chronic pain and these disorders has not yet been developed, although a diathesis-stress model has been proposed (Dersh et al., 2002), where underlying genetic predispositions/vulnerabilities to disorders are then ‘activated’ by the stress associated with the experience of chronic pain. Depression and insomnia are the most common co-morbid disorders experienced by chronic pain patients (Wilson et al., 2002) and theoretical reciprocal relationships exist between chronic pain and depression (Bair et el., 2003; Tang, Salkovskis, Hodges, Wright, Hanna & Hester, 2008) and chronic pain and insomnia (Smith & Haythornthwaite, 2004; Tang, Wright & Salkovskis, 2007). This suggests that interventions for insomnia and depression may yield improvements across a number of chronic pain-related variables including pain intensity, affective/sensory pain ratings and anxiety (Tang et al., 2007). The literature on the transition from acute to chronic pain is wide-spanning and confusing. Many potential psychosocial risk factors have been identified, some or all of which may contribute to explaining the variance of its aetiology. They include being female, older (Tsang et al., 2008), depressed mood, past traumatic life events, early negative beliefs/expectations surrounding the permanent nature of the acute pain (Boersma & Linton, 2006; Young Casey, Greenberg, Nicassio, Harpin & Hubbard, 2008), somatisation, health-seeking behaviour, poor sleep (Gupta, Silman, Ray, Morriss, Dickens, MacFarlane, Chiu, Nicholl & McBeth, 2007), psychological vulnerability, stress, late return to work (Hinrichs-Rocker, Schulz, Järvinen, Lefering, Simanski, & Neugebauer, 2008), distress (Gupta et al., 2007), fear-avoidance (Boersma & Linton, 2005; 2006; den Boer, Oostendorp, Beems, Munneke & Evers, 2006; Leeuw et al., 2007), catastrophising (Pavlin, Sullivan, Freund & Roesen, 2005), and social support/pain coping following its diagnosis (Evers, Kraaimaat, Geenen, Jacobs & Bijlsma, 2003). Perhaps the leading cognitive-behavioural model of the aetiology and maintenance of chronic pain is ‘The Fear-Avoidance Model of Musculoskeletal Pain’ (Leeuw et al., 2007). It explains how, through processes such as anxiety, pain-related fear, pain catastrophising, avoidance/safety-seeking behaviours and physical deconditioning an individual with acute pain can enter a vicious cycle of chronic pain which is maintained by dysfunctional cognitions and behaviours. The model has growing empirical support and has been used as the basis for many efficacious cognitive-behavioural interventions. Firstly we shall consider Cognitive-Behavioural interventions; of particular interest to this modality are the findings of Goossens, Vlaeyen, Hidding, Kole-Snijders & Evers (2005) which suggest that a patients’ initial beliefs surrounding the efficacy of the pain treatment significantly predict (immediately post-intervention and at 12 months) 4 key factors, namely active and positive interpretation of pain, better pain coping, less disability compensation, and better pain control. These findings bring into question issues of screening individuals for entry onto an intervention programme, perhaps first referring them to a psychoeducational programme to increase their expectations. A summary of a group of promising trials and systematic reviews of psychological/psychosocial interventions for chronic pain found improvements in function (Dysvik, Natvig, Eikeland, Brattberg, 2005; Guzmán, Esmail, Karjalainen, Malmivaara, Irvin & Bombardier, 2007; Morley, Williams & Hussain, 2008) and pain (Morley, Eccleston, Williams, 1999; Dysvik et al., 2005; Ostelo, van Tulder, Vlaeyen, Linton, Morley & Assendelft, 2005; Guzmán et al., 2007; Morley et al., 2008). More intensive therapy seems to be linked to greater improvements (Guzmán et al., 2007; Morley et al., 2008) and progressive relaxation has a large positive short-term effect on behaviour and pain (Ostelo et al., 2005). Otherwise, no clear evidence emerged from the group under review. A Cochrane systematic review (Foster, Taylor, Eldridge, Ramsay & Griffiths, 2007) of self-management educational programmes run by lay leaders, which included analyses of programmes for chronic pain, found a small yet significant reduction in pain over 11 studies. A review of Mindfulness-Based Stress Reduction (MBSR) (Bishop, 2002) cited preliminary evidence that MBSR can reduce emotional distress, functional disability, and psychiatric symptoms in chronic pain patients for up for 4 years post-treatment, even given its efficacy at reducing pain symptoms themselves only lasts for 6 months. Sullivan, Adams, Rhodenizer & Stanish (2006) carried out a risk factor targeted intervention to attempt to prevent the development of chronic pain following whiplash. Those who were assigned to the physical therapy + functional restoration treatment group had a 25% higher return-to-work rate compared with the group who just received physical therapy. Those subjects with the most initial risk factors did relatively the best, suggesting that targeting risk factors can improve function, return-to-work rates and mitigate development of chronic pain. A review of 13 hypnosis studies (Elkins, Jensen & Patterson, 2007) suggests that hypnotic interventions for chronic pain can significantly reduce pain perception, with a number of studies indicating efficacy beyond that of treatments such as psychoeducation and physical therapy. However, a number of methodological issues and generally low sample numbers makes these conclusions somewhat tentative. As well as potential direct effects, hypnosis could also help chronic pain patients’ anxiety, insomnia, and quality of life. A yogic breathing trial, targeting stress as a risk factor for illnesses and chronic pain found that the active intervention significantly reduced levels of anxiety, depression and stress, also increasing optimism (Kjellgren, Bood, Axelsson, Norlander & Saatcioglu, 2007). Graham, Lobel, Glass & Lokshina (2008) conducted a trial looking at anger and the benefits of emotional disclosure in those with chronic pain. Participants were asked to constructively express their anger in the form of letters, and compared to the control group they were better able to control their pain/mood and experienced a slight improvement in pain severity. A recent trial (Rau, Ehlebracht-König & Petermann, 2008) investigated the effects of motivational interviewing (MI) on coping in chronic pain, with results showing significantly improved cognitive and emotional coping with pain, although no effects were found for behavioural coping or self-efficacy expectations. A review (Barlow & Ellard, 2004) looking at psychoeducational interventions for children and adolescents with chronic disease found that cognitive-behavioural techniques aimed at social competence, reduced isolation, self-efficacy, hope, family functioning, self-management of disease, knowledge, and a reduction in pain were efficacious. A cognitive-behavioural programme trial (Merlijn, Hunfeld, van der Wouden, Hazebroek-Kampschreur, van Suijlekom-Smit, Koes & Passchier, 2005) aimed at adolescents with chronic pain attempted to change pain behaviours via relaxation strategies, physical activity, problem-solving strategies, cognitive restructuring, pain education and assertiveness training. Results suggested an improvement in quality of life, a greater level of familial support and understanding, and a reduction in pain. A Cochrane systematic review (Eccleston, Yorke, Morley, Williams & Mastroyannopoulou, 2003) of psychological interventions for pain management in children and adolescents found that there is very good evidence for psychotherapeutic interventions for chronic headaches, particularly using cognitive-behavioural and relaxation techniques, but not for any other types of chronic pain. Overall, it seems that some high quality efficacious psychosocial interventions for chronic pain exist, improving pain, function and mood, and offering various other benefits such as stress and anxiety reduction and increasing return-to-work levels. However, some of these trials were small, and significance and effects sizes were marginal, and numerous targeted factors were not affected significantly or clinically, and a significant percentage of patients did not achieve improvements in function or pain, leaving much scope for improvements in the field. Given the significant lack of response across treatment types, it is important to take into account patient homogeneity, that is to say, we must be careful not to assume that all patients with a chronic pain diagnosis will be alike on important variables which may play moderating or mediating influences on their outcome. Therefore, the concept of dividing patients into subgroups based on behavioural or psychosocial factors, with the idea of increasing patient engagement, outcome and adherence is one worth considering (Turk, 2005). A large proportion of those with chronic pain exhibit high levels of health anxiety (hypochondriasis) (Rode et al., 2006) so applying the cognitive-behavioural model of health anxiety (Salkovskis, Warwick & Deale, 2003) to the highly-anxious sub-group of chronic pain patients may yield primary and secondary benefits. Targeting co-morbid insomnia should also be a priority, particularly with its suggested reciprocal link to pain. Affective pain ratings are thought to contribute vastly (26%) to co-morbid insomnia (Tang et al., 2007), so interventions targeting pain appraisal are clearly highly important in this context. MacDonald, Linton & Jansson-Frojmark (2008) have identified avoidant safety behaviours and catastrophising as being shared cognitive-behavioural processes between co-morbid pain and sleep disorders. If confirmed, this study suggests the potential of targeting specific factors for primary and secondary improvements in chronic pain, an exciting prospect. In terms of health psychology interventions, doctors should be made (more) aware of the modifiable risk factors associated with the development of chronic pain and encouraged to screen those seeking primary care for acute pain for factors such as depression (Currie & Wang, 2005; Young Casey et al., 2008), high trauma exposure (Young Casey et al., 2008), fear-avoidance (den Boer et al., 2006; Leeuw et al., 2007), distress, negative beliefs/expectancies (Boersma & Linton, 2005; 2006) and where appropriate provide interventions targeting the specific modifiable risk factors, lowering the theoretical risk of transition from acute to chronic pain. If the pain does becomes chronic, the evidence suggests that early referral to an intensive multidisciplinary pain management programme is the optimum course. Bair, M. J., Robinson, R. L., Katon, W., Kroenke, K. (2003). Depression and Pain Comorbidity: A Literature Review. Arch Intern Med, 163:2433-2445. Barlow, J. H. & Ellard, D. R. (2004). Psycho-educational interventions for children with chronic disease, parents and siblings: an overview of the research evidence base. Child: Care, Health and Development, 30(6): 637-645. Bishop, S. R. (2002). What Do We Really Know About Mindfulness-Based Stress Reduction. Psychosomatic Medicine, 64:71-84. Boersma, K. & Linton, S. J. (2005). Screening to Identify Patients at Risk: Profiles of Psychological Risk Factors for Early Intervention. Clinical Journal of Pain, 21(1):38-43. Boersma, K. & Linton, S. J. (2006). Expectancy, fear and pain in the prediction of chronic pain and disability: A prospective analysis. European Journal of Pain, 10: 551-557. Currie, S. R. & Wang, J. (2005). More data on major depression as an antecedent risk factor for first onset of chronic back pain. Psychological Medicine, 35: 1275-1282.
de Ridder, D. & Schreurs, K. (2001). Developing interventions for chronically ill patients: is coping a helpful concept? Clinical Psychology Review, 21(2): 205-40.
den Boer, J. J., Oostendorp, R. A. B., Beems, R., Munneke, M. & Evers, A. W. M. (2006). Continued disability and pain after lumbar disc surgery: The role of cognitive-behavioural factors. Pain, 123: 45-52. Dersh, J., Polatin, P. B., & Gatchel, R. J. (2002). Chronic Pain and Psychopathology: Research Findings and Theoretical Considerations. Psychosomatic Medicine, 64:773-786. Dobbie, M. & Mellor, D. (2008). Chronic illness and its impact: Considerations for psychologists. Psychology, Health & Medicine, 13(5): 583-590. Dysvik, E., Natvig, G. K., Eikeland, O. J., Brattberg, G. (2005). Results of a multidisciplinary pain management program: a 6- and 12-month follow-up study. Rehabilitation Nursing, 30(5). Eccleston, C., Yorke, L., Morley, S., Williams, A. C. & Mastroyannopoulou, K. (2003). Psychological therapies for the management of chronic and recurrent pain in children and adolescents. Cochrane Database of Systematic Reviews, 1. Elkins, G., Jensen, M. P., & Patterson, D. R. (2007). 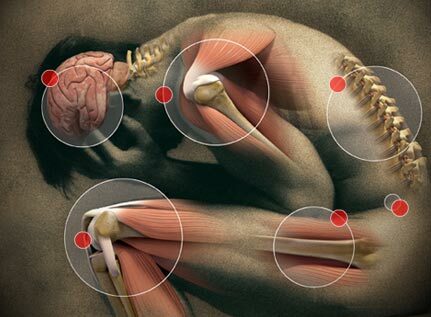 Hypnotherapy for the Management of Chronic Pain. Int J Clin Exp Hypn, 55(3):275-287. Epping-Jordan, J. E., Pruitt, S. D., Bengoa, R. & Wagner, E. H. (2004) Improving the quality of health care for chronic conditions. Qual Saf Health Care, 13:299-305. Evers, A. W., Kraaimaat, F. W., Geenen, R., Jacobs, J. W. & Bijlsma, J. W. (2003). Pain coping and social support as predictors of long-term functional disability and pain in early rheumatoid arthritis. Behaviour Research and Therapy, 41(11):1295-310. Foster,G., Taylor, S. J., Eldridge, S. E., Ramsay, J. & Griffiths, C. J. (2007). Self-management education programmes by lay leaders for people with chronic conditions. Cochrane Database of Systematic Reviews, 4. Goossens, M. E. J.B., Vlaeyen, J. W. S., Hidding, A., Kole-Snijders, A. & Evers, S. M. A. A. (2005). Treatment Expectancy Affects the Outcome of Cognitive-Behavioral Interventions in Chronic Pain. Clinical Journal of Pain, 21(1): 18-26. Graham, J. E., Lobel, M., Glass, P. & Lokshina, I. (2008). Effects of written anger expression in chronic pain patients: making meaning from pain. Journal of Behavioral Medicine, 31(3): 201-212. Gupta, A., Silman, A.J., Ray, D., Morriss, R., Dickens, C., MacFarlane, G. J., Chiu, Y. H., Nicholl, B. & McBeth, J. (2007). The role of psychosocial factors in predicting the onset of chronic widespread pain: results from a prospective population-based study. Rheumatology, 46: 666-671. Guzmán, J., Esmail, R., Karjalainen, K., Malmivaara, A., Irvin, E. & Bombardier, C. (2007). Multidisciplinary bio-psycho-social rehabilitation for chronic low-back pain. Cochrane Database of Systematic Reviews, 2. Hardt, J. Jacobsen, C., Goldberg, J., Nickel, R. & Buchwald, D. (2008). Prevalence of Chronic Pain in a Representative Sample in the United States. Pain Medicine, 9(7): 803-812. Hinrichs-Rocker, A., Schulz, K., Järvinen, I., Lefering, R., Simanski, C. & Neugebauer, E. A. (2008). Psychosocial predictors and correlates for chronic post-surgical pain (CPSP) – A systematic review. Eur J Pain, 24. Kjellgren, A., Bood, S. A., Axelsson, K., Norlander, T. & Saatcioglu, F. (2007). Wellness through a comprehensive yogic breathing program – a controlled pilot trial. BMC Complimentary and Alternative Medicine, 19, 7: 43. Leeuw, M., Goossens, M. E. J. B., Linton, S. J., Crombez, G., Boersma, K. & Vlaeyen, J. W. S. (2007). The Fear-Avoidance Model of Musculoskeletal Pain: Current State of Scientific Evidence. Journal of Behavioral Medicine, 30, 1. LeFort, S. M., Gray-Donald, K., Rowat, K. M. & Jean, M. E. (1998). Randomized controlled trial of a community-based psychoeducation program for the self-management of chronic pain. Pain, 74(2-3): 297-306. MacDonald, S., Linton, S. J. & Jansson-Frojmark, M. (2008). Avoidant safety behaviors and catastrophizing: shared cognitive-behavioral processes and consequences in co-morbid pain and sleep disorders. International Journal of Behavioral Medicine, 15(3): 201-210. Martire, L. M., Lustig, A. P., Schulz, R., Miller, G. E. & Helgeson, V. S. (2004). Is it beneficial to involve a family member? A meta-analysis of psychosocial interventions for chronic illness. Health Psychology, 23(6): 599-611. Merlijn, V. P., Hunfeld, J. A., van der Wouden, J. C., Hazebroek-Kampschreur, A. A., van Suijlekom-Smit, L. W., Koes, B. W. & Passchier, J. (2005). A cognitive-behavioural program for adolescents with chronic pain-a pilot study. Morley, S., Eccleston, C., Williams, A. (1999). Systematic review and meta-analysis of randomized controlled trials of cognitive behaviour therapy and behaviour therapy for chronic pain in adults, excluding headache. Pain, 80(1-2): 1-13. Morley, S., Williams, A. & Hussain, S. (2008). Estimating the clinical effectiveness of cognitive behavioural therapy in the clinic: evaluation of a CBT informed pain management programme. Pain, 137(3). Ostelo, R. W., van Tulder, M. W., Vlaeyen, J. W., Linton, S. J., Morley, S. J. & Assendelft, W. J. (2005). Behavioural treatment for chronic low-back pain. Cochrane Database of Systematic Reviews, 1. Parker, J. C. (1995). Stress Management. In P. M. Nicassio & T. W. Smith (Eds. ), Managing chronic illness: A biopsychosocial perspective (pp. 285-312). Washington, DC: American Psychological Association. Pavlin, D. J., Sullivan, M. J., Freund, P. R. & Roesen, K. (2005). Catastrophizing: a risk factor for postsurgical pain. Clinical Journal of Pain, 21(1): 83-90. Rau, J., Ehlebracht-König, I., Petermann, F. (2008). Impact of a motivational intervention on coping with chronic pain: results of a controlled efficacy study. Schmerz, 22(5): 575-578, 580-585. Rode, S., Salkovskis, P., Dowd, H., & Hanna, M. (2006). Health anxiety levels in chronic pain clinic attenders. Journal of Psychosomatic Research, 60(2),155-161. Sarafino, E. (2006). Health Psychology: Biopsychosocial Interactions. 5th ed. John Wiley & Sons Inc.
Salkovskis, P.M., Warwick, H.M.C., & Deale, A.C. (2003). Cognitive-Behavioral Treatment for Severe and Persistent Health Anxiety (Hypochondriasis). Brief Treatment and Crisis Intervention, 3(3), 353-367. Smith, M. T. & Haythornthwaite, J. A. (2004). How do sleep disturbance and chronic pain inter-relate? Insights from the longitudinal and cognitive-behavioral clinical trials literature. Sleep Med Rev., 8(2):119-32. Stanton, A. L., Revenson, T. A. & Tennen, H. (2007). Health Psychology: Psychological Adjustment to Chronic Disease. Annual Review of Psychology, 58: 565-592. Sullivan, M. J., Adams, H., Rhodenizer, T. & Stanish, W. D. (2006). A psychosocial risk factor–targeted intervention for the prevention of chronic pain and disability following whiplash injury. Physical Therapy, 86(1). Tang, N.K.Y., & Crane, C. (2006). Suicidality in chronic pain: A review of the prevalence, risk factors and psychological links. Psychological Medicine, 36(5), 575-586. Tang, N.K.Y., Salkovskis, P., & Hanna, M. (2007). Mental defeat in chronic pain: Initial exploration of the concept. Clinical Journal of Pain, 23 (3), 222-232. Tang, N.K.Y., Wright, K., & Salkovskis, P.M. (2007). Prevalence and correlates of clinical insomnia co-occurring with chronic pain. Journal of Sleep Research, 16 (1), 85-95. Tang, N.K.Y., Salkovskis, P.M., Hodges, A., Wright, K. J., Hanna, M., & Hester, J. (2008). Effects of mood on pain responses and pain tolerance: An experimental study in chronic back pain patients. Pain, 31;138(2):392-401. Tsang, A., Von Korff, M., Lee, S., Alonso, J., Karam, E., Angermeyer, M. C., Borges, G. L., Bromet, E. J., de Girolamo, G, de Graaf, R, Gureje, O, Lepine, J. P., Haro, J. M., Levinson, D., Oakley Browne, M. A., Posada-Villa, J., Seedat, S., Watanabe, M. (2008). Common chronic pain conditions in developed and developing countries: gender and age differences and comorbidity with depression-anxiety disorders. J Pain, 9(10):883-91. Turk, D. C. (2005). The Potential of Treatment Matching for Subgroups of Patients With Chronic Pain: Lumping Versus Splitting. Clinical Journal of Pain, 21(1): 44-55. Vlaeyen, J. W. & Morley, S. (2005). Cognitive-behavioral treatments for chronic pain: what works for whom? Clinical Journal of Pain, 21(1):1-8. Wilson, K. G., Eriksson, M. Y., D’Eon, J. L., Mikail, S. F. & Emery, P. C. (2002). Major depression and insomnia in chronic pain. Clinical Journal of Pain, 18(2): 77-83. Yach, D., Hawkes, C., Gould, C. L. & Hofman, K. J. (2004). The Global Burden of Chronic Diseases: Overcoming Impediments to Prevention and Control. The Journal of the American Medical Association, 291, 21. Young Casey, C., Greenberg, M. A., Nicassio, P. M., Harpin, R. E. & Hubbard, D. (2008). Transition from acute to chronic pain and disability: A model including cognitive, affective, and trauma factors. Pain, 134: 69-79. This entry was posted in Health, Psychology and tagged chronic pain, clinical psychology, health, health psychology, pain. Bookmark the permalink.